Sunday, January 20, 1828.Spencer County, IN. Tuesday, January 20, 1835.Vandalia, IL. Lincoln is placed on select committee with Gordon of Morgan and Hughes of St. Clair to consider debt collection bill. He votes with majority (yeas 40, nays 9) to save time and money by not printing memorials in "House Journal. "House Journal. Wednesday, January 20, 1836New Salem, IL. Lincoln surveys 12-acre tract for David Hart, and writes technical notes. Notes of a Survey Made for David Hart, 1836, CW, 1:44. Friday, January 20, 1837.Vandalia, IL. House takes up committee report on slavery resolutions. 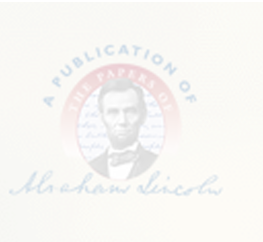 To resolution stating that Congress has power to deal with slavery in District of Columbia, but should do nothing, Lincoln proposes amendment: "Unless the people of said district petition for the same." Amendment is lost.House Journal. Monday, January 20, 1840.Springfield, IL. Lincoln writes Stuart that legislature has done nothing of importance. He wants as many copies of new life of Harrison as can be spared, and everything else Stuart thinks "will be a good`war-club'." He declares nomination of Harrison "takes first rate." In House he introduces minor bill.Abraham Lincoln to John T. Stuart, 20 January 1840, CW, 1:184; House Journal. Wednesday, January 20, 1841.Springfield, IL. Lincoln writes to his law partner Congressman John T. Stuart regarding the appointment of a postmaster for Springfield, Illinois. Lincoln recommends Dr. Anson G. Henry, in part, out of his desire to keep Henry in Springfield. Lincoln writes, "I have, within the last few days, been making a most discreditable exhibition of myself in the way of hypochondriaism and thereby got an impression that Dr. Henry is necessary to my existence." Lincoln apologizes for not "writing more; I have not sufficient composure to write a long letter." Abraham Lincoln to John T. Stuart, 20 January 1841, CW, 1:228-29. Friday, January 20, 1843.Springfield, IL. In People ex rel. McGoon v. Browne, defendant is given until Monday to make return to alternative mandamus.Record. Tuesday, January 20, 1846.Springfield, IL. Lincoln is busy with two Supreme Court cases, Kincaid v. Turner, and Ross et al. v. Nesbitt. First case is suit for damages to property belonging to Turner resulting from prairie fire started by Kincaid. Robbins appears for appellant, Harris and Lincoln for appellee. Judgment of circuit court is affirmed. In Ross et al. v. Nesbitt, Lincoln appears alone for defendant.Record. Wednesday, January 20, 1847.Springfield, IL. Lincoln votes for John Henry in special election to fill congressional seat left vacant by E. D. Baker's resignation. Henry is elected over J. W. Crosby and Arch Job. Election Returns. He represents appellant in Trumbull v. Campbell, an assumpsit case appealed from Sangamon County Circuit Court to the Illinois Supreme Court. Logan and Bledsoe appear for appellee. Record. Saturday, January 20, 1849.Washington, DC. In Journal Lincoln's name does not appear on absentee list. Monday, January 20, 1851.Springfield, IL. Bill to incorporate Illinois Central Railroad is still in committee. According to affidavit of Anthony Thornton, representative from Shelby, Lincoln and several members of legislature were retained by company to promote its interests. Affidavit, files of Illinois Central Railroad Co.
Another source claims he opposed Illinois Central. John W. Starr, Lincoln and the Railroads: A Biographical Study (New York: Dodd, Mead, 1927), 42-45. At any rate he is actively interested in bill. Tuesday, January 20, 1852.Springfield, IL. On January 22, 1852, Lincoln writes to Hezekiah Morse Wead, Lewistown attorney, about case in federal court. "We finished arguing, and submitted the case yesterday afternoon, and it is not yet decided. We had a two days trial of it." He is in U.S. Circuit Court. Abraham Lincoln to Hezekiah M. Wead, 22 January 1852, CW, 2:117. Saturday, January 20, 1855.Springfield, IL. Tuesday, January 20, 1857.Springfield, IL. "During the entire week the trial of Erastus Wright has been progressing in the U.S. Court. . . . The trial has been largely attended and much interest manifest by people from every part of the State. The U.S. attorney Mr. William J. Allen has managed the case in a very able manner. The defense, Messrs. Logan, Lincoln and McClernand have made an able defense." Jacksonville Sentinel, 23 January 1857. Friday, January 20, 1860.Springfield, IL. Lincoln writes Gustave Koerner: "Yesterday the Judge decided the demurrer against us on all the points. On looking over your memorandum left with me, I find you desire me to 'have the case set for trial as late as I can'—but really I find I have no power [to] set a time for the trial. The opposite party is not here, in person, or by counsel; and the Judge, properly enough, refuses to make a stipulation for the absent party." Abraham Lincoln to Gustave P. Koerner, 20 January 1860, CW, 3:514-15. Sunday, January 20, 1861.Springfield, IL. Cong. Kellogg (Ill.) and Lincoln spend most of day together. N.Y. Herald, 21 January 1861. Monday, January 20, 1862.Washington, DC. President signs appointment of E. M. Stanton as secretary of war. William D. Kelley, Lincoln and Stanton: A Study of the War Administration of 1861 and 1862: with Special Consideration of Some Recent Statements of Gen. George B. McClellan (New York: Putnam, 1885), 17. Receives written protest from committee representing 14th Brooklyn Regiment against change in number to 84th. N.Y. Tribune, 21 January 1862. Tuesday, January 20, 1863.Washington, DC. At cabinet meeting President asks secretaries for opinions on relative merits of five-foot gauge railroad as opposed to four-foot-one-and-a-half-inch gauge. Order Establishing Gauge of Union Pacific Railroad, 21 January 1863, CW, 6:68. Transmits to Senate report regarding exportation of articles of contraband for use of French army in Mexico. Abraham Lincoln to the Senate, 20 January 1863, CW, 6:66-67. Receives request from Gov. Yates (Ill.) for appointment of Col. William Ross as bearer of dispatches so that he may go to Europe for eye operation. Yates to Lincoln, 20 January 1863, Abraham Lincoln Papers, Library of Congress, Washington, DC. Army of Potomac on march. Blizzard sweeps country. Lincoln in White House hears frozen crystals beat on windows of office. Monaghan, Diplomat, 279. Deplores distress of people in southwest Missouri and informs Samuel T. Glover, prominent Unionist, that Congress would oppose extension of railroad to Springfield, Mo. Abraham Lincoln to Samuel T. Glover, 20 January 1863, CW, 6:66. Wednesday, January 20, 1864.Washington, DC. President transmits to Congress report of former Sen. Wright (Ind.) on International Agricultural Exhibition held in Hamburg. Abraham Lincoln to the Senate and House of Representatives, 20 January 1864, CW, 7:140. Interviews Arkansas delegation regarding creation of military government. Chicago Tribune, 22 January 1864. Orders election for governor of Arkansas. Abraham Lincoln to Frederick Steele, 20 January 1864, CW, 7:141-42. Gen. Butler has long interview with President in afternoon. Evening Star (Washington, DC), 21 January 1864, 2d ed., 2:4. Lincoln confers with Cong. Clay (Ky.) in evening about getting authority to manage family property. Clay to Lincoln, 21 January 1864, Abraham Lincoln Papers, Library of Congress, Washington, DC. John G. Nicolay thanks H. J. Alvord for present of whitefish to President. CW, 8:530. Friday, January 20, 1865.Washington, DC. President interviews Mrs. Mary E. Morton regarding seizure of her property by provost marshal. Abraham Lincoln to Joseph J. Reynolds, 20 January 1865, CW, 8:228-29. Cabinet meets. Sec. Stanton reports on his trip to Savannah, Ga. Welles, Diary, 21 January 1865. Lincoln receives Mr. Abel and gives him card to paymaster general's office. Brice to Lincoln, January 20, 1865, Abraham Lincoln Papers, Library of Congress, Washington, DC. Orders: "That no clearances for the exportation of hay from the United States be granted until further orders, unless the same shall have been placed on shipboard before the publication hereof." Order Concerning Export of Hay, 20 January 1865, CW, 8:227.